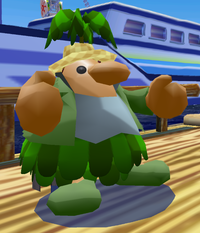 The Big Daddy of Blooper-surfing or Big Daddy for short (also known as Big Daddy Blooper-surfer, Blooper-surfing Big Daddy, or simply Bloopy) is a tan-colored Pianta who owns the Blooper Racers found in Super Mario Sunshine. He is only seen in Ricco Harbor, and only appears in two episodes. He is very friendly and he allows Mario to ride his colored Bloopers for free, although he "waives all liability for accidents," crashing a Blooper will instantly make Mario lose a life. Big Daddy owns three different colors of Bloopers in the game – pink, green, and yellow. This page was last edited on December 23, 2018, at 06:47.